If you haven't already seen our not so subtle hints recently then we are delighted to confirm that our next locomotive(s) are the LB&SCR Terriers; the original A1 version and the later A1X rebuild. 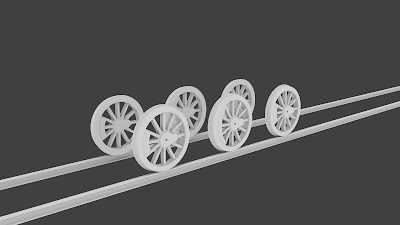 These plucky little underdogs had a long life being originally built between 1872 and 1880, 50 of them found use on standard passenger services on the London, Brighton and South Coast railway. They had a rapid acceleration and were ideal for the frequent start/stop commuter services around the London suburbs however as passenger traffic increased and more coaches were added to trains they started to suffer from a lack of power. However this didn't stop them from finding use on branch lines as short passenger services or for freight shunting. Between 1898 and 1905 23 of the 50 members of the class were withdrawn and many were sold to other railways resulting in the Terriers carrying a bewildering array of liveries. 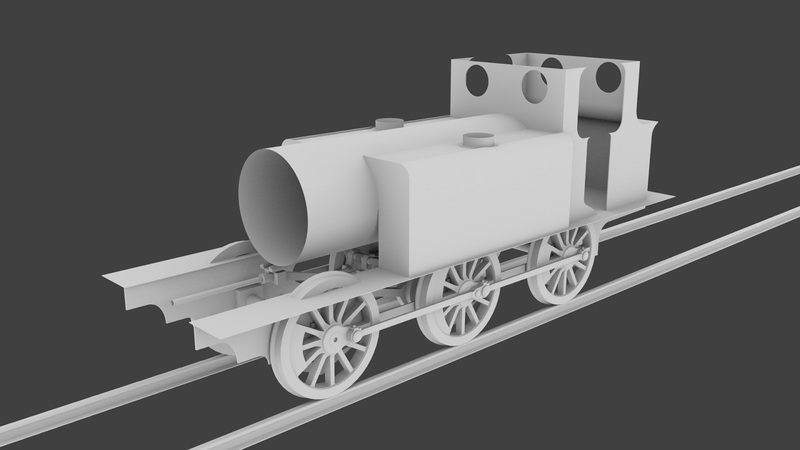 In the early 20th century some of them were re-boilered with an increase in weight and boiler pressure and became the somewhat less Victorian looking A1X class. Making it into the Southern grouping in 1923 the engines continued to find uses and appeared on two of their most iconic routes; Hayling Island and the Isle of Wight. By 1948 when British Railways took over the "Big Four" there was still one A1 and fourteen A1X locomotives in service and they continued to be used on the Kent & East Sussex Railway and the Hayling Island branch. Eventually these lines closed and the final operational A1X (No. 32678) was removed from service on 10 August 1963, over 90 years after the first Terrier had been built. But this was far from the end of the story and No. 55 Stepney became the first standard gauge preserved locomotive on the newly established Bluebell Railway in 1960. Ten of the Terriers still exist in preservation in various modified states and some are still running today, being rescued from such obscure fates as being static displays at Butlin's holiday camps. That means that one fifth of the entire class still exists after nearly 140 years! To this day Terriers hold a special place in many enthusiast's hearts - not as awe inspiring Kings, A4s, Merchant Navy's or locomotives that pull a dozen coaches at dizzying speeds - but as the plucky pocket sized underdog that made it from the height of Victorian locomotive engineering all the way to the end of British Railways and right into our hearts in preservation. Stepney even appeared as itself in a one of the Railway Series books by Rev. W. Awdry. Building the Terriers is an exciting prospect. It's also quite daunting despite the engine being quite small! We will be building the A1 and A1X versions to represent all 50 members of the class. Liveries will include the original Stroudley Improved Engine Green (that odd livery that's mostly yellow/mustard/ochre), Marsh Umber (the two tone "brown" livery), Southern Green and BR Lined Black. We also have a list of over a dozen other liveries which we hope to poll you all on at a later date to help decide which others should be included. If any livery includes names then they will be editable so you can name the locomotives as you see fit. Additional stock is undecided as yet but a set of Stroudley coaches seems most likely. Which publisher we will use is not yet decided. Modelling started a couple of weeks ago and we are pleased to show the following images of how much we have completed to date. As ever, we started with the wheels. Then the frames and footplate were added. 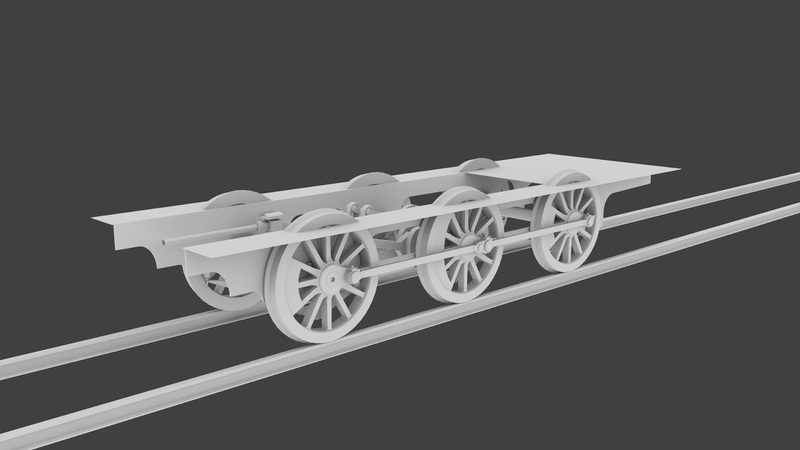 A rough representation of the inner gear was added, this would be rescaled and rebuilt as needed later. 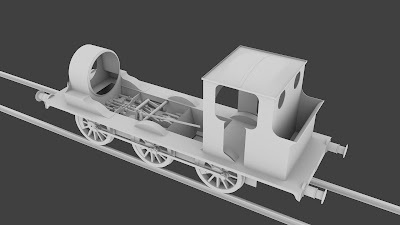 The smokebox, chimney and dome complete the familiar silhouette. Start of the work to fit everything in between the frames. The gear still needs some remodelling but the dimensions are good. Buffers, brakes, tank filler caps and other details and the A1 is well under way. It is our intention to return to our weekly Friday blog updates and next week we hope to show the A1 completed and the start of the work on the A1X. Which publisher you choose is entirely up to you of course. I still find myself having a slight preference for Steam. But SSS gives you more chance for scenarios on a variety of lines. And probably has other benefits for you. 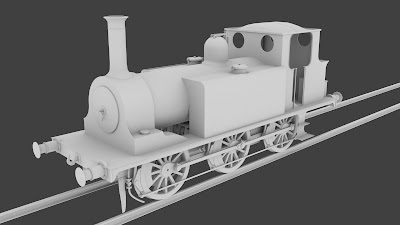 Nice loco about to become even better. Will there also be southern wartime black? will all variants of stepney be added?